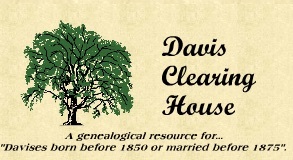 We gather research on the name of Davis - and variations Daves, Davess, Davi, Davice, David, Davies, Davise, Daviss, Deavis, Dever, Devers, Divis, Doveis, Dovis, Duis, Dawes, Dewees born before 1850 or married before 1875. Our present database consists of about 200,000 individual Davis records. Last Updated 11/23/2015 / Copyright © 2015 Davis Clearing House / All rights reserved.